The RS24/32 Skyline Series Metal Building Skylight fits any 24″ trapezoidal or 16″ vertical standing seam roof. 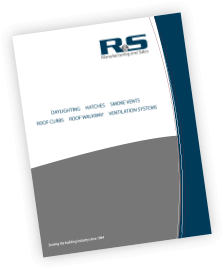 R&S offers a wide range of glazing options that meet any building code requirement. This skylight system installs in 1 hour or less. The design provides exceptional condensation control and features an integral gutter which traps and evaporates residual interior moisture. Watershed exceeds competitive models giving customers an edge when biding projects. Optional OSHA-compliant fall protection screen. New construction or retrofit. In addition, all kits include mastic, sealant, fasteners and trim for a complete install. The RS24/32 Skyline base is is 0.080″ aluminum and includes a 20-Year warranty. Skylight Glazing: (1) Prismatic Acrylic double dome skylights for optimal visible light throughout the building. (2) Polycarbonate domes balance lighting with maximum strength and hail-resistance. Optional polycarbonate multi-wall inner panels yield low solar heat gain and U-Factor values to meet current IECC energy code requirements. All skylight domes include a 10-Year warranty. Provide roof panel make, model when requesting quote. RS24x120-T2-CAP-WAP for a daylight system designed to integrate with a 24″ O.C. Standing Seam roof panel. Skylight is 10′ long and features a double-dome Prismatic Acrylic glazing. Units lengths may be sequenced in increments of 5′-0″. See submittals and Installation guides on the Documentation tab for details. R&S manufactures a vast array of products to fit your project needs. We aim to supply all of your metal building roof accessory needs, not just one product. Why go to multiple vendors when R&S can supply it all?